Mental damage from the Diamonds, hm...like magnets to a tape recorder? Well that was really pretty sweet. Ah, so confirmation that corruption is something inflicted by the Diamond Authority. It kind of gives you the feeling they sent all those troops there specifically to be corrupted and drawn into the cluster. Pretty sick. 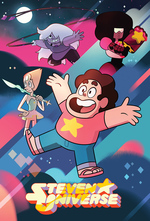 - Confirmation that corruption is a weapon used against the rebel gems by the diamonds. Garnet and Pearl survived by Rose's bubble, Amethyst survived by being underground (or not formed yet? ), Lapis survived in the mirror. - Apparently Centipeedle wrote her true name down, but not in English. I wonder if that will ever come up again? - Importantly, there were four diamonds while Earth was being homeworldified, but there are three diamonds now. Now we know Centipeedle blames three diamonds for her corruption, but tellingly doesn't implicate which three. Is it possible that pink diamond, now absent, is one of these three? Does that even make sense? They're clearly teasing the idea that Rose is a diamond, even though it's just as possible (and more likely) that Pink Diamond was shattered and her Pearl and her top soldier carried on in her legacy. - the writing getting to Steven healing Centipeedle was pretty sad "My future vision implies this will happen, let's go do it" is kinda weird. The joys of writing stories in 11 minute chunks. - I wonder if there is some way of repairing corruption on that ship, or was Centipeedle just trying to get to her crew? - Interesting that the leaks we saw were 100% spot on, there's a leaked image of an upcoming fusion which seems far-fetched but the way these leaks are who even knows? - Jasper is Era 1, so presumably she knows about the corrupting weapon. Peridot, probably not. Gems have bodies made "of light"; the weapon involves a huge bright burst. Garnet's explanation was frustrating, because what does the "mind" of a Gem consist of, if not their self embodied in their Gem? How can you hurt a Gem without hurting their, uh, Gem? Centipeetle only drew three diamonds, so whatever happened to Pink Diamond happened sometime after the moonbase and arena were built, but before the end of the Gem War. Very possibly it triggered the Gem War. My current theory is that there was some disagreement between PD and the other three. She was shattered, and, in a really dark twist, parts of her Gem were used to make the corruption bomb. Which is why it's so powerful. Turning Gems into weapons/tools has been a consistent thing where Homeworld is concerned. It would be the ultimate repudiation of her. Rose and her Pearl and the other PD followers take up PD's lost cause, and the other Diamonds, probably weakened by killing PD + the war, withdraw, setting off the bomb in a last act of retaliation, after starting up the Cluster. I also have a theory that the war + loss of PD + possibly the bomb itself took a toll on Homeworld that it has not recovered from. Gem corruption makes sense to me. When Amethyst's gem was cracked her ability to control herself was impaired but the underlying mind was intact. the gem is a physical object encoded with the gem's living essence. If that essence is damaged there's no easy fix. I like the idea that PD was used to create the corrupting weapon, poetic justice. I suspect that Pink Diamond was an important part of the colonization process. Peridot says Homeworld is running out of resources, and homeworld apparently isn't interested in retaking resource-rich Earth, or presumably the other life-bearing worlds of the universe. I wonder just how many gems even exist anymore. This reminds me, the Ruby Squad that showed up must have also been (mostly?) Era 2 Rubies. I wonder if a hallmark of Era 2 gems is the inability to summon a weapon. Okay, am I nuts, or did Centipeedle try to press one of the buttons to open the door in the Temple? You know, one of the five buttons that lead to the Gem's individual rooms? As she were trying to get into, say .... maybe her *own* room? I think Centipeedle was just waiting on the warp pad. I think Centipeetle was trying to use the warp pad, yeah. Honestly I haven't given up on 'Rose was Pink Diamond' yet-- her healing powers and affinity for organic life are the sort of thing we haven't seen in any other Gem yet, and could well have been crucial to Homeworld's ability to build colonies. And this definitely confirms the difference between corruption and a cracked Gem. Poor Centipeetle. Something to think about. The fact that Centipeedle was writing correctly, just in Gemlish, from the start indicates that Steven did a fairly good job of healing the conscious portions of her mind. She can think and reason pretty well, she's just trapped in a monster body, and she can't speak. So what's up with the Gems not bothering to teach Steven the Gem language? Isn't that ... borderline neglect? Even the level of wishful thinking required to make that seem like an OK decision is on the verge of delusional ... This doesn't seem like the sort of thing Pearl would overlook. rustcrumb: They could be using the same logic my parents used for me in deciding to raise me in English. I was born and raised in Malaysia, but the only person in my family especially fluent in Malay was my sister and she was a pre-teen at the time. Everyone knew Bengali, but there was nowhere in Malaysia where I could use it. Everyone also knew English, and English was more useful in Malaysia, so English it was! Asides from the Gems - who know English - who else would Steven have communicated with in Gemlish especially while he was growing up on Earth? The Crewniverse has said that Gem language happens to be English, when spoken, which is hugely unlikely but for kids, just a show, just relax, etc. But that does kind of mean that, whatever its structure, written Gem language pretty much has to be a variant of English. JHarris, that sounds more like a Star Trek Universal Translator answer. I didn't see/hear where the Crewninverse said that, though. In Star Trek, everyone is speaking their native language and their com badges translate it for the listener. (Star Trek Voyager's episode "The 37's" explains it pretty straightforwardly) It's a little hand-wavy and magical, which is how I can see similar happening for Gems. They're probably speaking in Gem, but their Gem powers automatically translate that to English for us and Steven. Sort of like how their Gems automatically adjust for gravity. The Gems don't seem to teach Steven proactively. They generally wait for him to ask. It's convenient for storytelling. So, Centipeedle was a Diamond soldier, and she was loyal to the Diamonds, right up until the bomb went off. She was never a Crystal Gem. I am worried that she may still be loyal to the Diamonds, if she ever recovers her faculties. She was caught by the bomb by accident, so she needn't even blame the Diamonds for her condition. I know she likes chaaaaaps, but that might not be enough to make her switch loyalties. I think Ian Jones-Quartey was the one who made the comment about spoken gem language, in a tweet I believe. I don't have the tweet at hand, though. The Gems healed her (as best they could) and reunited her with the ship and crew. That's got to count for something. Does she know that those were Crystal Gems, and rebels, though? She might think they're fellow stranded Diamond soldiers or something. My head canon is that humans speak gem language, because the gems have been on earth so long, in this universe, living alongside humans, that human language developed by just copying gem language, imitooting them exarctly.